Not only is handball a fun and exciting social sport to play, it also offers some fantastic benefits. Most people are either unaware of these benefits, or they fail to take them into consideration. It is interesting to know that handball actually helps to improve your arm muscles, in addition to your upper body strength.Handball is also useful in improving your mental focus, co-ordination and self confidence. In terms of fitness, handball is the sport to choice.You will be surprised to learn that it provides you with a full body workout. If you are looking to gain muscle strength, tone, improve fitness or lose weight, then handball can assist you in all of these areas. The truth is that there is vast amounts of slamming, jumping and turning in the game, which means that your entire body and the majority of your muscle groups will be getting a very intense workout. 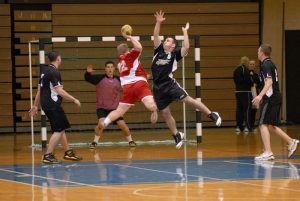 Instead of going to the gym and doing boring hours of cardio on a treadmill, you can choose to get involved in handball. Handball has been known to improve your cardiovascular endurance, and it is very good for your heart and your health. It is also helps you to stay fit while you age. If you are looking to burn calories while having fun, then you have found the sport for you. Handball offers one of the best workouts and it burns fat without you even knowing. You will be having fun and burning calories at the same time. This is in addition to all of the mental benefits of the sport. If you are looking to develop better hand-eye coordination, then this is the sport for you. You will learn how to anticipate the where ball will end up. In terms of learning how to work well under pressure and with a team, you have met your match with handball. It is a great sport to start playing as a child because it teaches you many valuable life lessons with regard to teamwork, co operation, communication and much more.